You've probably heard that English is being ruined — by the Internet, by texting, by Americans, by young people who have no respect for proper grammar. 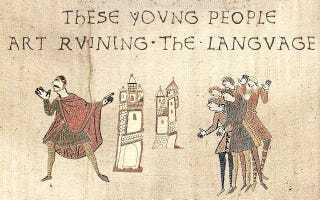 But it turns out that people have always worried over English, and over the centuries, have accused all sorts of things of "ruining" the language. Top image made with the Historic tale construction kit at bayeux.datensalat.net. Let's start with one thing that actually did put English at genuine risk. In 1066, William the Conqueror occupied England and claimed the English throne. Being the Duke of Normandy, William did not speak English, but Norman French, and French became the language of government and business. But for centuries, English held on at the fringes, the language of the occupied people, even as king and queen after king and queen spoke French and Latin, but hardly a word of English. It's small wonder that commentators feared for the fate of the language, even three hundred years after the invasion. The first biography of an English layperson, the Knight William Marshall, Earl of Pembroke, was written in the 12th century in French. Eleanor of Aquitaine, the Queen consort of King Henry II, patronized poets who began singing of Arthurian legend in French. But while French remained the language of the court, English remained the language of the laborers, and in the 14th century, it made a comeback. Melvyn Bragg, in his book The Adventure of English, credits a number of factors with the resurgence of English in the 14th century: the deaths of a disproportionate number of clergy members during the Black Death, the use of English as the language of populist revolt, the marriages between English women and Norman men, resulting in generations of bilingual children. Eventually, English reasserted itself in the classroom and in business. In 1377, King Richard II, became England's first monarch to use English exclusively since the Norman Conquest. Of course, English came out of this battle quite changed; the language of Edward the Confessor was not the language of Geoffrey Chaucer. It had retained many of its roots, but also greedily consumed plenty of French (and later Arabic) words in the intervening years. by intermingling and mixing, first with Danes and afterwards with Normans, in many people the language of the land is harmed, and some use strange inarticulate utterance, chattering, snarling, and harsh teeth-gnashing. Yes, Virginia, people have always been complaining about the English language. Higden was an old-school defender of the language, and curiously, he was defending a version of the language that no longer existed in the common vernacular. After all, as David Crystal points out in his excellent book The Fight for English, many of the words Higden uses in this very complaint ("country" and "language," for example) come from the French. William Caxton, who introduced the printing press to England, had to deal with a very particular problem when it came to printing: there was no one English language. A single word in English might have a dozen radically different spellings and pronunciations, and as soon as he started printing, Caxton received criticisms from people who felt that he wasn't printing their version of English. But Caxton was a rather shrewd businessman. For one thing, he knew when to accept a correction without argument, such as when Lady Margaret, the sister of King Edward IV "found a default" in Caxton's English. For another, he was careful to be humble about his English. In the prologue of the first book printed in England, The Recuyell of the Historyes of Troy, Caxton is humble about his English, apparently assuring the reader that he is not trying to claim the English in his book is the best English, only that it is his English. Printing did have a profound effect on English, in the end. Printers tended to be a bit arbitrary with placing the letter "e" at the ends of words, worrying less about consistent spelling than the length of the line. And Dutch typesetters introduced their own spellings. Many early defenders of the language felt that handwritten books were more carefully copied than printed books, but of course the printed word eventually reigned. As the Renaissance took hold, English was still considered something of a second-rate language, unable to express the full range of ideas that Latin, for example, could. Gradually, scientists and other thinkers in the 16th and 17th century would introduce thousands of Latin and Greek-derived words into the English language. Suddenly, English was peppered with words like "chaos," "specimen," "frugal," "cautionary," and, aptly, "lexicon." I am of this opinion that our own tung shold be written cleane and pure, unmixt and unmangled with borowing of other tunges, wherein if we not heed by tiim [by time], ever borowing and never payeng, she shall be fain to keep her house as bankrupt. Supporters of the new words, on the other hand, felt that the new words enriched the language. Sir Thomas Elyot called it "the necessary augmentation of our language." Eventually, this argument sorted itself out naturally. While many of the words coined during this period survived, others, like "fatigate," "nidulate," and "abstergify," fell out of use. The Elizabethan and Jacobean eras were an exciting time for the English language. You had dramatists like Christopher Marlowe and William Shakespeare coining words left and right and showing off both the power and the plasticity of the English language. But in the 1600s, some writers on English felt that the poets had gone too far, making English too ornate and unwieldy. While many today hold the era of Shakespeare as the golden age of the English language, Thomas Sprat, who would eventually become Bishop of Rochester, wrote in 1667 that English was deteriorating precisely because it was filled with rhetoric and metaphor (he wasn't a fan of the new classical words, either). He implored the newly formed Royal Society "to return back to the primitive purity, and shortness, when men deliver'd so many things, almost in an equal number of words." A few years later, the poet and critic John Dryden would take aim at Shakespeare specifically, but for different reasons: because Shakespeare had, in his estimation, poor grammar. Dryden felt that the English of the late 17th century was simply more grammatical than Shakespeare's English. Like so many people, Dryden believed that he spoke the best version of English. That was in 1631. I'm sure he things the state of affairs has only gone down from there. is extremely imperfect;...its daily Improvements are by no means in proportion to its daily Corruptions;... it offends against every Part of Grammar. Swift railed against the poets, the spelling reformers, the young academics who pick up new phrases. He worried that English speakers would forget the histories of their words. He felt that English needed protecting, and that some official body was needed to set it back on its proper path and ensure that it wasn't further corrupted. In 1711, for example, Joseph Addison complained about the way words were being "miserably curtailed" - he mentioned pos (itive) and incog (nito). And Jonathan Swift thought that abbreviating words was a "barbarous custom". English folks are often accusing Americans of ruining the language, but lexicographer Noah Webster felt that the English (by way of the Normans) ruined it first. Webster was one of a number of orthographers who felt that English should look more, well, English and less French. He eventually became a strong advocate of dropping the "u" from words with -our endings and changing the -er ending to -re. In his dictionaries, Webster used his own preferred spellings, which eventually caught on in the United States, resulting in the current gap between American and British English spellings. The now fashionable pronunciation of several words is to me at least very offensive: cóntemplate—is bad enough; but bálcony makes me sick. At various times in the history of modern English, writers have praised the speech of people who drop the "g" in -ing words when speaking and have worried over the disappearance of the letter "r" in the pronunciation of words like "harm" and "arm." Much like changing spellings, new phrases, and shifting grammatical styles, these pronunciations haven't ruined English, as far as we can tell. They've only changed it. Melvyn Bragg, The Adventure of English: The Biography of a Language. David Crystal, The Fight for English: How Language Pundits Ate, Shot, and Left. Henry Hitchings, The Language Wars: A History of Proper English. Jack Lynch, The Lexicographer's Dilemma: The Evolution of 'Proper' English, from Shakespeare to South Park. Ammon Shea, Bad English: A History of Linguistic Aggravation.